Digital innovation has fundamentally changed how the world operates. As modern technology permeates every area of our lives, our expectations around the availability of information and the speed with which we can obtain it are higher than ever before. This applies to how we shop, as well as how we make business and major life decisions. As the digital era continues to unfold, your organization must quickly respond to these everchanging customer expectations in order to compete and remain relevant. Likewise, your service desk must be nimble, in order to support shifting organizational priorities, capitalize on new opportunities, and satisfy growing end user demands for instantaneous and seamless service. But this “need for speed” runs counter to traditional approaches to ITSM that emphasize risk mitigation and control over speed and agility—leaving IT teams hamstrung and unable to play to their full potential. You can strike the right balance between going faster and maintaining control, though. It just requires some new plays. 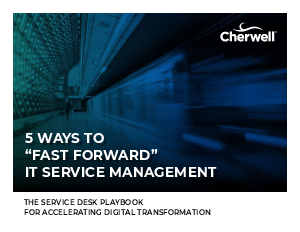 Read on to learn how you can accelerate your service management initiatives and, in doing so, “fast forward” your organization’s broader mission to transform digitally.